What's your favourite use for books? 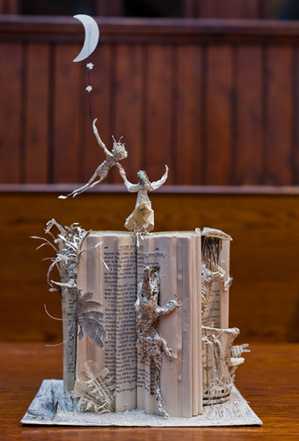 Scotland's Mystery Book Sculptress Strikes Again! OK, so books make for a good read, but they also have many other uses - doorstops, decorations, footstools to reach to the top of the shelf for shorties like me .... but my favourite use of them (other than reading of course) is in these uniquely witty anonymous sculptures which have popped up all over Scotland in libraries and other institutiones over the last 2 years - guerilla art which is all about celebrating books and reading. You can read more about them at www.finebooksmagazine.com. So, what's your favourite, non-mainstream use for books? Someone created Hogwarts Castle out of the Harry Potter series. I, know, pretty amazing what some people can do. Well, other than to read, I'd really love to own one of those book clutches you see getting around on places like Etsy. Made out of hardcover books, with little handles and clasps attached, they are the perfect way to display your love of books I think. I also have a diary that was repurposed out of a Little Golden Book that I love, done by a company called Rebound Books who specialises in this. It includes the story itself, with the diary pages interspersed between. Very cute.